What is your favorite outdoor wheels? 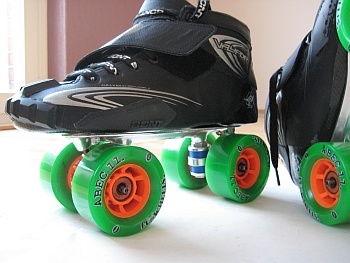 I havn't skated on the velocity race wheels,would like to as they seem to be the wheel of choice on the forum here. do either of you know anyone with the velocity/twisters? if so, borrow them. I would love to hear your comparisons. I don't think that the VR or RD Twister are available or common in Australia. Borrow them yours, if you like to get their opinion! and skate like nobody's watching. I am not sure how much shipping would be to Australia (orders over $100 are free to the US) but if you could find someone to split an order of RD Aerials with you (they come in high low setups so you need two pairs to get a set of 65mm and a set of 70mm Twisters) you could just buy two pairs for $60 a pair. You might even be able to sell the skates themselves on Craigslist and make a couple bucks back. Maybe I need to track these down when I am over your way in August. The slower one of this race seems to need the 70mm RDs. You can't argue that logic! my fav outdoor wheels are anything that doesn't rattle your teeth out while skating! as i am wheelie challanged i will even use my only pair of semi decent indoor wheels outdoors. wondering if the new timaru surface would be good with an indoor wheel? 10K? A sprint race? No Way! Come on guys, real competition starts with 100k!!! I have a set of these. Krypto roadrunners, 70mm x 35mm and 78a. Great training wheel. My are worn down to about 65mm. Ran atom poisons on Wednesday on some new asphalt and they were pretty fast. They r a 62x44 but not sure of hardness, 84a I think. I have been looking at skateboard wheels to try and find a good 70mm wheel. Came across Cadillac Wheels. They are making a 70x35 in an 80a. I think I might try a set. I have been looking at skateboard wheels to try and find a good 70mm wheel. Came across Cadillac Wheels. They are making a 70x35 in an 80a. I think I might try a set. I'd be very interested to know how you like them, as I have considered those too. For now I've got enough 70mm wheels, but it would still be nice to know in case I ever run out. For longer distances the ABEC11 Flywheels 76mm, 81A. Skateboard wheels, shaped on a lathe by Johannes. To have fun outdoors: Kryptonics Impulse 58mm, 78A. Very narrow wheels, ideally for dancing and spinning. Jbgerman, guttentag, was is los? I looked at those abec 11 flywheels yesterday. Look like they have a great hub. Did you trim the urethane off the back of the wheel so it is flush with the hub? And do you have any issues with hitting the wheel on the boot? The bearings sit in the middle of the wheels (centered) and the inner side has to be cut to the edge of the inner bearing. Hitting depends on the primary on the plates, secondary on the tightness of the cushions/trucks and also on the boot. I had to change the blue SG cushions and go to slightly harder yellow at the BOEN Speed plates to avoid rubbing. So I looked some more at abec 11 and they have a 72mm that is 84a. I saw it listed as a freeride and a striker. They list the contact patch as 32mm but I can not tell what the hub is like. Especially the inner side. Does anyone have any feedback on the roll line heliums? 64mm and 83a sounds pretty good. Large hub too. I'm gonna see if I can get a hold of Abec 11 tomorrow and get some more info. I read a review of the cadillacs, longboard though, that said they flat spotted and coned pretty quickly. Not sure if I will get a set now or not. Always look onto http://www.silverfishlongboarding.co...l_Reviews.html if you need info about longboardwheels. Yeah I saw that about the cadillacs. I did find another wheel. Landyachtz zombie hawgs. They are 76mm with a 42mm core. 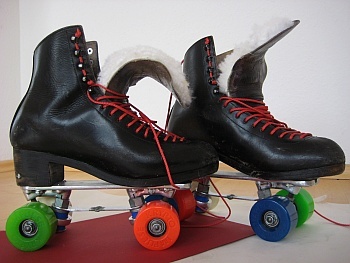 Side set so you don't have to run them on a lathe to run them on skates. Come in 78a, 80a, 82a, 84a, and 88a. They are a bit wide, in the 40-45mm range, but you can lathe the outside off to line up with the hub. Good reviews on silverfish too. The only bad thing is they have rounded edges which I am not a fan off. I will probably get a set and post my thoughts next week. I like the size, hub size and the duros that are available plus by the time they are 70mm the rounded edges should be gone. I have not measured the width but I know the contact patch is 33mm. A little pricey too, $50-60 for 4 wheels.